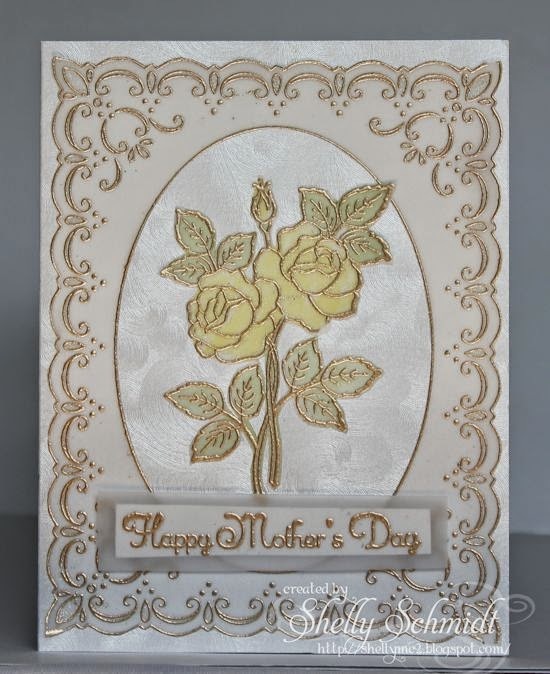 We are creating for Mother's Day at Sweet Stamps this week. I used the same supplies and made 2 different cards for the weekly theme. I used some Silver Lustre cardstock from Paper Temptress as the base. I added the embossed Parchment with a spray adhesive after removing the center oval. The Roses are embossed on Parchment vellum, colored with Copics and fussy cut out. I used the spray adhesive to attach the roses. The sentiment is embossed n vellum and adhered to a smaller piece of Silver Lustre- centered under the sentiment. I took a Stardust Gelly Roll pen and added sparkle to the teardrop shapes and scallops around the edges. For the second card, I stamped and embossed on the Parchment Vellum- I love the look of the Queen's Gold EP on the Vellum. I used the Stylus from the back side of the vellum and debossed the edge scallops and tear drop shapes. I pierced the center oval with the 2 needle tool and the magnetic grid. I love the look of the piercing on the vellum. This is the link to Parchment images and the tools available at Sweet Stamps.com. Here is a direct link to the Monthly Challenge as well- Dryer Sheet Flowers 5/4-6/1. You have a chance to WIN- winners drawn by Random.org. WOW Shelly!!! This is knock dead gorgeous!!! SO elegant and beautiful. Great job on both cards Shelly. It is nice to see two versions of the same general card. Both are excellent. Wow, your cards are both FABULOUS!!! I love the the embossing...so beautiful! Beautiful cards! Vellum just scares me to death, never have much luck with it, great job GF! 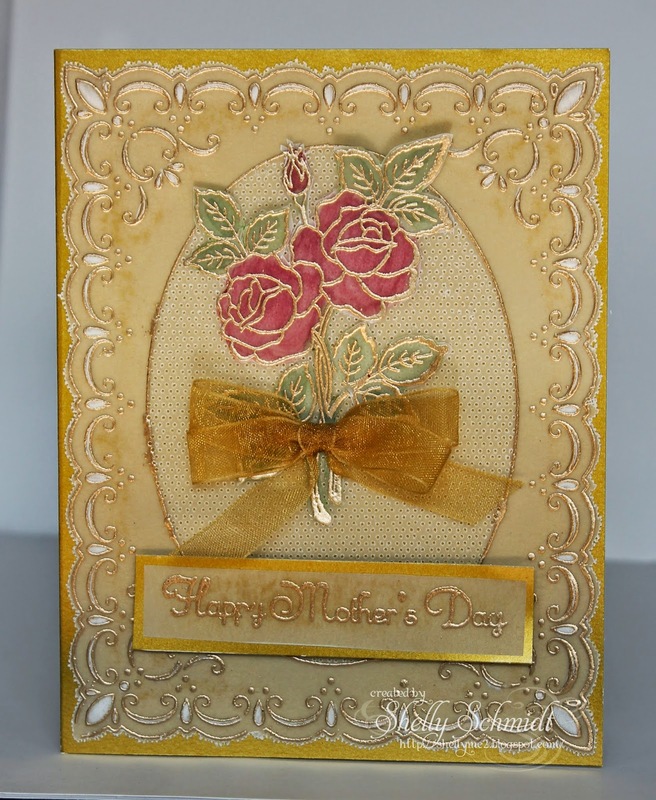 Wow, two beautiful and elegant cards for Mother's Day! The embossing and colors are so stunning. Love them. Awesome card, love the embossing and beautiful job with the vellum. Thanks for p0laying along with us at the Sisterhood of the Snarky Stampers for the y is for your mama challenge. So gorgeous Shelly. Love the embossing on the vellum. It's hard to say which one I like the best. This is beautiful! I love the gold on the vellum!!! Two beautiful cards - love the use of vellum! Thank you for joining us at Get Inky! Both of these are stunning! Some day I'm going to try this as I always love what you do with the parchment and stylus. Beautiful Mother's Day card Shelly!! Thanks for joining the sisterhood of snarky stampers!! 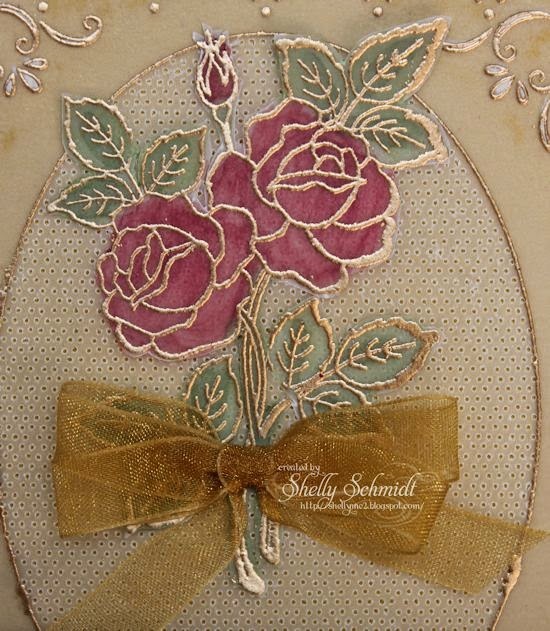 Wow, so pretty and intricate--beautiful Mother's Day cards, Shelly! Oh my - Love your cards!! The gold on the vellum is gorgeous!! Why don't I ever think to do this???? Two amazing cards, Shelly. I love this style..it has such an elegant feel to it. Beautiful bows and embossing…you really out did yourself this week! Very pretty. I love that you used all the same supplies and created 2 different cards! Thanks for joining our For Mom challenge at Creative Corner Challenges this week. Don't forget about our DT call. Wow, both these cards are absolutely gorgeous! Perfect embossing, colouring, piercing... everything. :) Thanks for joining the fun at The Sisterhood of Snarky Stampers! Oh wow! Your cards are so delicate and elegant - simply beautiful! Gorgeousness! The gold card wins for me. Thanks for joining us at the Sisterhood of Snarky Stampers. Oooh! Look at all that luscious gold! Beautiful cards! Thanks for joining us at the Sisterhood of Snarky Stampers! I have a bunch of those stickers and never turn out as nice as that.Thanks for joining us at the Sisterhood of Snarky Stampers. Your cards are elegant and stunning! I love both of them but the silver one is my favorite! I think I need to get some vellum and parchment. Thanks for joining our "Your Mama" challenge at the Sisterhood of Snarky Stampers!